Thursby Personal Property Auction — Harritt Group, Inc.
10% Buyer’s Premium added to the hammer bid price to determine the final purchase price. Majority of the auction held indoors inside a large pole barn. 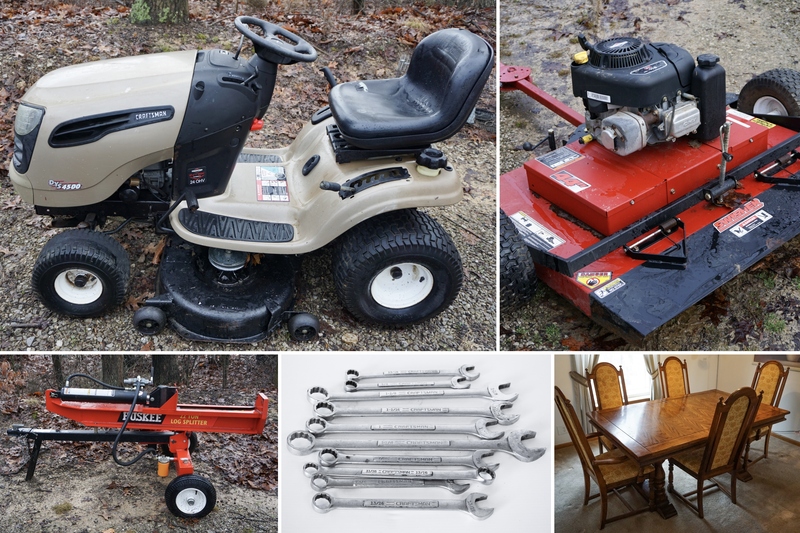 Selling live on site the following personal property including a Craftsman riding lawn mower, Huskee log splitter, finishing mower, Craftsman and Snap-On tools, records, furniture and more. Craftsman DYS 4500 24 HP riding lawn mower with 544 hours, Huskee 22 ton hydraulic gas power log splitter, Swisher 44” pull behind finishing mower with 11.5 HP, Gray Portamatic airlift, Continental Shop Hoist 4000, Craftsman 20” chainsaw, Poulan chainsaw and several industrial tool benches. Dremel scroll saw, Belsaw, Guardian Power drill press, Walker Turner drill press, bench grinder, Central-Machinery grinder, Craftsman router, Ryobi miter saw, (3) Porter Cable air nail/staple guns, Chicago sawzall, Quantum Pro sander, Black and Decker mouse sander, Craftsman electric router, Craftsman All In One Cutting Tool, chainsaw blade sharpener, biscuit jointer, Tough-test electric sander, air compressor, arc welder, acetylene set and much more. Snap-On tool chest, Craftsman rolling tool chest, hundreds of hand tools including a large selection of Snap-On and Craftsman wrenches, socket sets, screwdrivers and more, 8’ Werner fiberglass ladder, large selection of air tools including drills and impact wrenches, chisels, Craftsman shop vac, Snap-On rolling stool, Snap-On clock, table vises, planes, tap and die sets, drill bits, oil cans, trailer hitch kit, welding helmets, copper electric cords, scrap copper and copper tubing and a large selection of auto maintenance tools. Deep freeze, dining room table and chairs, china cabinet, server, cloth couches, Sleep Number King size bed, dressers, office desk, Lane cedar chest, Claro-phonic phonograph and records, stationary bike, Lionel train engines, cars and track, vintage Kodak 35 film camera, Vivitar film camera, multiple camera lenses and flashes, vintage LP records including Elvis Costello, Foreigner, Steve Martin, Monty Python, Billy Joel, Journey and more, vintage headphones, dishes and other household goods. I-64 to Palmyra/Corydon Exit #105 south onto IN-135 for 6 miles. Turn left on Fairview Church Rd SW with an immediate left turn onto Old Hwy 135 SW followed by an immediate right onto Union Chapel Road. Stay on Union Chapel Road for a ½ mile with the auction on right.